More and more athletes are choosing to follow Colin Kaepernick’s lead and protest their so-called “oppression” by refusing to stand for the National Anthem. They don’t seem to realize that the longer this drags on, the lower NFL ratings drop and the more expendable these clowns become. Antonio Cromartie just learned that the hard way. The Colts didn’t take long to respond. 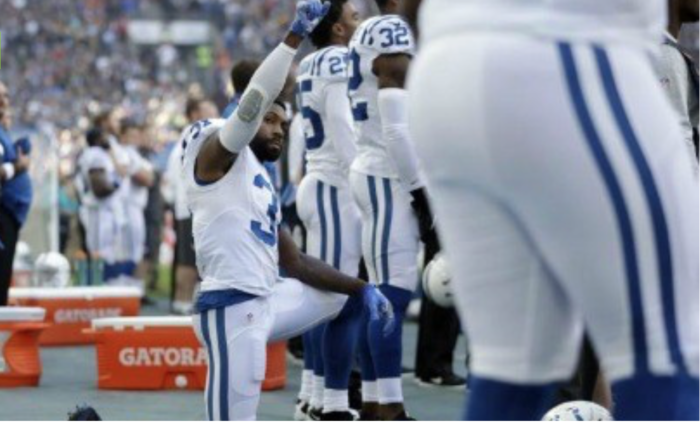 Despite signing a $3 million deal with the Colts at the beginning of the season, Cromartie was fired. So, he’s probably regretting that little stunt now, especially considering he owes over $300,000 in child support. Cromartie has fathered at least 12 children by eight different women and so that $3 million salary could have come in handy. But hey, he had to be one of the cool kids and make a statement. He just wasn’t a good enough football player to keep, despite his antics. Hey, Comartie: was it worth it?